Are you ready to ROCK?!! 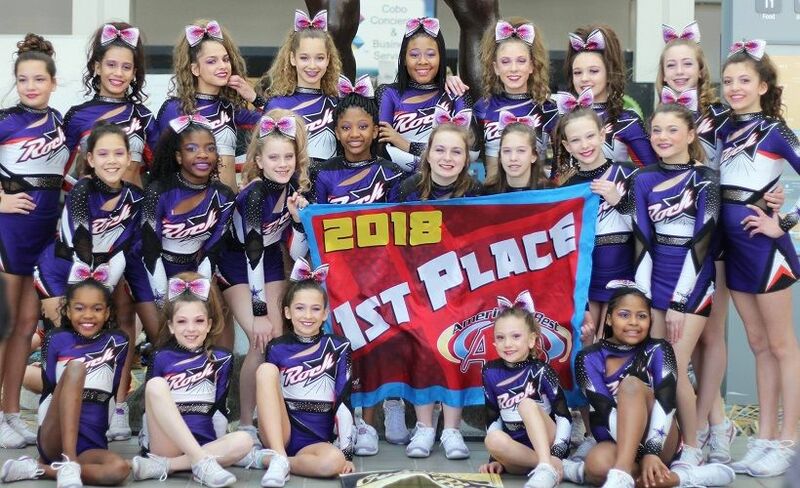 Our team placement process is low stress and fun for everyone to ensure we start off Rockin' with the Best! We have two group evaluation sessions. You only need to attend one, but it is recommended you attend both. Friday May 18 5:30-8:00PM & Saturday May 19 12:00-2:30PM. At the end of the group evaluations we will assign the athletes into callback groups. Athletes may be assigned to more than one group. Each group will return on Sunday May 20 between the hours of 9AM and 6PM in blocks of 1-2 hours. We will send out team placement notifications via the email you have registered with and will get started with our Rockin' season!!! How did you find out about us? If it was through someone in our program, who may we thank for your referral? We are thrilled you are joining our program - Let us know why you want to be a ROCKSTAR! Please describe any prior cheerleading, tumbling, or gymnastics experience. Include level and stunt position for cheerleading. Please list the times you are NOT available for practice from June - August, such as other sports or work commitments. Also, please let us know about vacations planned. Double teaming (being on more than one squad) has many benefits. Gym time is almost doubled, and an athlete has the opportunity to advance quicker. Are you interested in being on more than one team? We will be selecting alternates for our squads. An athlete will be placed permanently on one team, then can be an alternate on a second team. Are you interested in being an alternate for a team? Please list emergency contact information (Name, Relationship, and Phone Number) during Team Placements. In consideration of the services and activities provided by Spirit Athletics LLC, DBA Rockstar Cheer Cleveland (hereafter referred to as RCC) and Spirit Athletics Booster Club, DBA Rockstar Cleveland Booster Club (hereafter collectively referred to as RCBC), including but not limited to all aspects of cheerleading, tumbling, trampoline, dance training, fitness, conditioning, and other services provided. I hereby voluntarily agree to release, discharge, and hold harmless RCC and RCBC indefinitely, including their owners, officials, shareholders, agents, employees, contractors, and all other persons or entities acting in any capacity on their behalf, whether paid or volunteer, from any and all liability, claims, demands, actions or rights of action arising from injury to the person or property of myself and the children listed below occurring on the premises of RCC and RCBC, as well as events and activities sponsored, sanctioned, or attended by RCC and/or RCBC off the premises of RCC and RCBC including travel to and from aforementioned events and activities. This release is intended to be binding upon myself, my children, my parents, my heirs, assignees and successor in interest, and anyone claiming by or through myself of the child. I am fully aware that any activity involving motion, height, or athletic activity creates the possibility of serious injury, including paralysis and death. I understand and acknowledge that the activities that I, my child, and other participants engage in while on the premises or under the auspices of RCC or RCBC pose known and unknown risks which could result in injury, paralysis, death, emotional distress, or damage to me, my child, property, or third parties. I expressly agree and promise to accept and assume all of the risks, known and unknown, connected with RCC and RCBC related activities. My participation and that of my child is purely voluntary. I elect for myself and my child to participate in such activities in spite of the risks. Should RCC or RCBC be required to incur attorney's fees and costs to enforce this agreement, I agree to indemnify and reimburse them for such fees and costs. In the event that I file lawsuit against RCC or RCBC, I agree to do so solely in the State of Ohio and I further agree that the substantive and procedural laws in that state shall apply in any such action without regard to the conflict of laws rules thereof. I agree that if any portion of this agreement is found void or unenforceable, the remaining portions shall remain in full force and effect. By signing this document, I acknowledge that if anyone is hurt or property is damaged during my participation or the participation of any of my children in this activity, I may be found by court of law to have waived my right to maintain a lawsuit against RCC or RCBC on the basis of any claim from which I have released RCC and RCBC by signing this agreement. I certify that participants, myself and my child(ren), have had a physical examination by a qualified health professional within the past year and are in proper physical and mental condition to participate in the activities of RCC and RCBC without limitation. If limitations exist, they will be documented in the special comments section of the family/student registration and accompanied by medical documentation. I will notify RCC and RCBC if any changes in physical condition or insurance information occurs that the staff need to be aware of in order to ensure safe and proper care of the participants. I certify that the child has health, accident, and liability insurance to cover bodily injury or property damage that may be caused or suffered while participating in this event or activity, or else I agree to bear the costs of such injury or damage to my child. I understand that in the event of an injury or damage to myself or my child, I will be responsible for payment of medical treatment and any other costs that arise regardless of validity or coverage provided by my insurance. I further certify that I and my child are willing to assume and bear the costs of all risks that may arise or be created, directly or indirectly, through or by any such condition. I understand that the owners, instructors, contractors, volunteers, and other staff of RCC and RCBC are not physicians or medical practitioners of any kind, with the above in mind, I hereby release RCC and RCBC owners, instructors, contractors, volunteers, and other staff to render temporary first aid to my child in the event of any injury or illness. In case of emergency requiring medical treatment, the undersigned hereby authorizes RCC and RCBC to take myself and/or my child to a qualified medical or hospital facility for care and treatment, including calling an ambulance if deemed necessary. I understand that I will be responsible for any and all costs of medical attention and treatment. I have read the Release and Waiver of Liability, Assumption of Risk, and Indemnity Agreement, understand that I have given up substantial rights by signing it and have signed it freely and without any inducement or assurance of any nature and intend it to be a complete and unconditional release of all liability to the greatest extent allowed by law and agree that if any portion of this agreement is held to be invalid the balance, notwithstanding, shall continue in full force and effect. I attest that all information presented in factual. I HAVE HAD SUFFICIENT OPPORTUNITY TO READ THIS ELECTRONIC DOCUMENT IN ENTIRETY. I UNDERSTAND, ACCEPT, AND AGREE TO BE BOUND BY ITS TERMS.